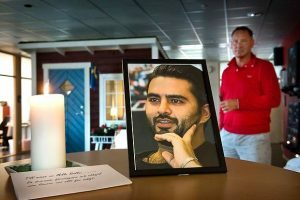 RIO DE JANEIRO, BRAZIL – On Saturday, June 28th, Mille Ballai, the 34 year-old charismatic co-owner of the Alto Vidigal hostel died from a head trauma resulting from a serious altercation. Police found valuables, including about $7,000 in cash, a computer and two cellphones, suggesting the incident wasn’t the result of an attempted robbery. Mille Ballai, an Iranian naturalized in Sweden who moved to Rio last year to take over Alto Vidigal, was killed last weekend, photo by Stefan Bennhage/GP. With no clear motive for the murder, police are looking into several lines of inquiry, including analyzing CCTV footage from the hostel and interviewing staff. The investigation into the murder could be set back as those with information might be reluctant to speak to police for fear of retribution. Ballai, who worked as a film producer in Sweden had fallen in love with the favela community after staying at another hostel there and had immersed himself in the local scene. Just the day prior to his death in a profile interview with the Wall Street Journal he had said he felt completely safe in Vidigal. While Vidigal was once considered a dangerous place, it had become increasingly gentrified, thanks in part to the success of hostels such as Alto Vidigal which offered large weekly parties and interesting experiences to an international crowd. The presence of the hostel had not gone without controversy, with some linking it to rising property prices and a legal dispute over the land in 2013.